It has been really interesting to me that many have placed the 1 billion mark in a variety of areas and have had a variety of reasons why. Many have attempted to use their understanding of place value digits (there are 12 zeros in 1 trillion and only 9 zeros in 1 billion, so 1 billion should be 3/4 of the way toward a trillion) or their knowledge of prefixes to help (million, billion, trillion… so it must be 2/3 the way along the line). Others thought about how many billions are in a trillion asking themselves, “Is their one-hundred or one-thousand billions in a trillion?” Using this strategy, everyone picked a spot toward the left, but some much closer to zero than others. Others did something interesting though. They started placing other numbers on the number line to help them make sense of the question. Often placing 500 billion in the middle, then 250 billion at the 1/4 mark and so on until they realized just how close to 0 a billion is when we are considering 1 trillion. How long is 1 million seconds? Without doing ANY calculations would you guess the answer is several minutes, hours, days, weeks, months, years, decades, centuries…? Can you even imagine a million seconds without calculating anything? How about 1 billion seconds? Or 1 trillion seconds? I bet you’ve started trying to calculate right! That’s because these numbers are so abstract for us that we can’t imagine them. What numbers can/can’t the students in our classrooms conceptualize? What practices do we do that gets kids to think about digits more than magnitude? What practices could/should we be including that helps our students make these connections? Before we start working with operations of any given size, I think we need to spend time making sure our students can visualize and estimate the size of the number. Working with numbers we can’t imagine doesn’t seem productive for our young students! In our rush to move our kids into more “complicated” mathematics, we often move too quickly through numbers to include numbers that are too abstract for our students! We think that if a student can accurately carry out a procedure that they understand the numbers they are working with. However, I’m sure we have all seen many students who produce answers that are completely unreasonable without them noticing. Is this carelessness, or is it a lack of understanding of the magnitude of the numbers involved? 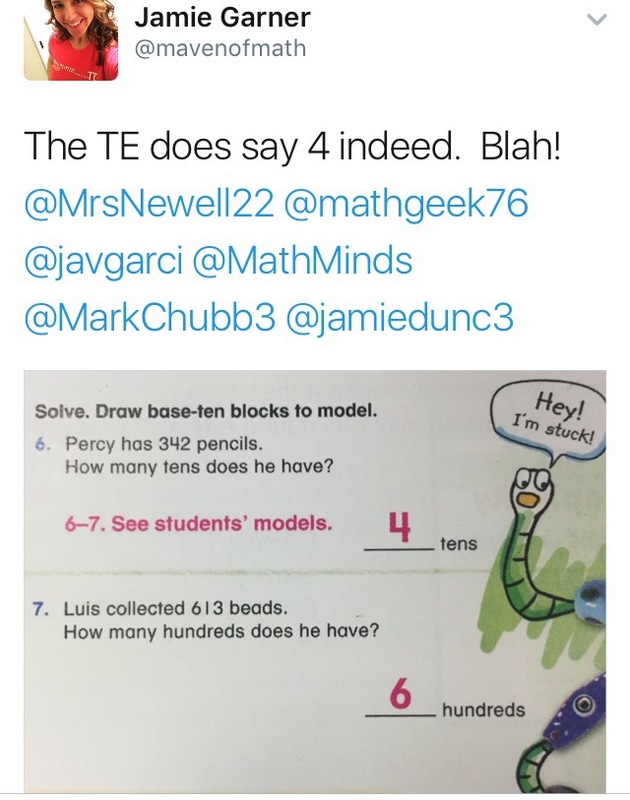 Or possibly that our students aren’t visualizing the size of and relationship between the numbers??? If our students attempt to make sense of the problem, they will be completely wrong! 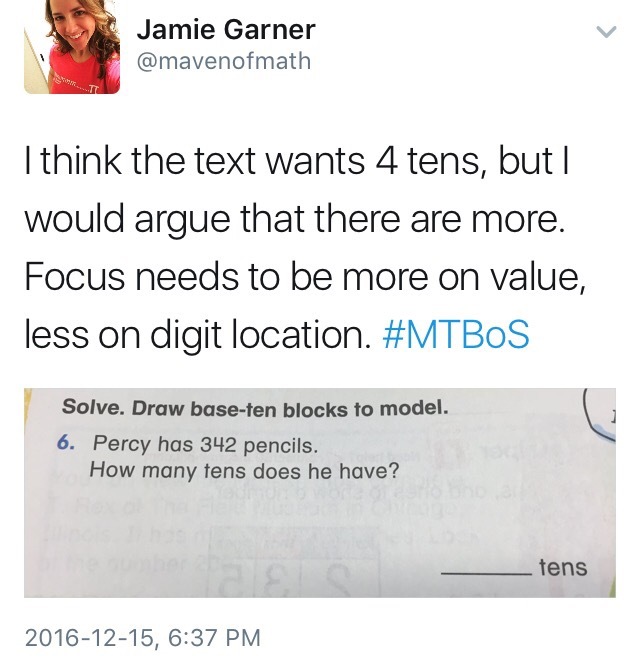 In fact, many students will likely answer 4 because they’ve been trained not to think at all about the mathematics, and instead focus their attention on what they think the text wants them to do. These, along with pretty much any standard algorithm (see Christopher Danielson’s post: Standard Algorithms Unteach Place Value) tell our kids to stop thinking about what makes sense, and instead focus on steps that help kids get an answer without understanding. Use contexts that make sense to our students (not pseudo-contexts like the pencil question above). Provide plenty of experiences where students are making sense of numbers visually. When we allow our students to access their Spatial Reasoning we are allowing them to see the relationship between numbers and help them make connections between concepts. Below are 2 activities taken from Van de Walle’s Student Centered Mathematics. Think about how you could adapt these to work with numbers your students are starting to explore (really big or really small numbers). How might you see how well your students understand the numbers that are really large or really small? How are you helping your students develop reasonableness when working with numbers? What visuals are you using in your class that help your students visualize the numbers you are working with? What practices do you use regularly that help with any of the 3 above?